Every surfer remembers their first surfboard. There is something mystical about it. For some odd reason, you remember the who, what, where, why and when of it all. Ask any surfer what his/her first board was, and they’ll rattle off the color, the dimensions, and whatever became of it. It is because you get so much more from the purchase of a surfboard than fiberglass and foam; you get an attitude that comes with it, and it is something no one can ever take away from you. No matter your gait, when you put a surfboard under your arm, it becomes a strut. You enter a whole new realm with a surge of confidence that you never had before. During the summer of 2009, I was coaxed into the world of Facebook by a dear friend. While chatting with my old surf buddy Scott Collings, we recalled our first boards, entering into this really cool state of stoke that had us both typing like banshees! I told him about my first board, a 6’10” Bing “Foil” that I purchased in the summer of 1970 for a mere $75 from my friend Stanley Trapp. For me it was a gold mine, for it was just like the board that Rolf Aurness had won the World Title with the previous month. And at the same moment I was taking ownership of my new Foil, my brother Jimmy was surfing up and down the California coast with none other than…Rolf Aurness. I rode that Foil the entire summer before it was stolen from my carport just like mom had warned me it would if I didn’t put it away. Scott told me about his first time surfing, about he and his brother Jeff riding an old log with the glass half torn off (talk about itchy). Then he bragged about his first board, a 9’4″ TP by Allen (Total Performance), a Christmas gift from his dad when he was ten years old. We progressed into our second boards and our thirds. There was lots of namedropping and placedropping, and we went on for hours. “Boy, does this bring back good times,” said Scott. 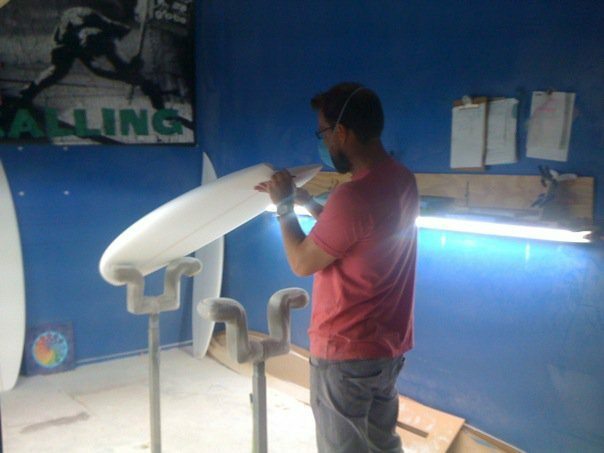 Upon creating the group, I realized I had no pictures of my first surfboard, so I googled for an image of a Bing Foil, found one, and contacted surf legend Bing Copeland seeking permission to use the photo. If you’re not a surfer, Rick’s post just might appear to ramble. However, if you grew up surfing in North Florida in the sixties, it undoubtedly, not only flows, it strikes a familiar chord that anyone who has ever ridden a wave can more than relate to. In the upcoming months, more and more people joined, including a few more heavy hitters, and some sent along pictures. Two photos in particular caught my eye, as they seemed to epitomize the joy and fascination of board ownership. The picture was so priceless; we befriended one another and were soon chatting surf into the wee hours of the morning. We’ve become more than just “facebook friends.” Sarah is one of my biggest supporters, having linked me up with the likes of Corky Carroll for a recent story and helping me with my writing in other areas, as well. In fact, “typing like a banshee!” is her line. I stole it from her. We still chat whenever one of us sees the other online, and the stories never seem to end. 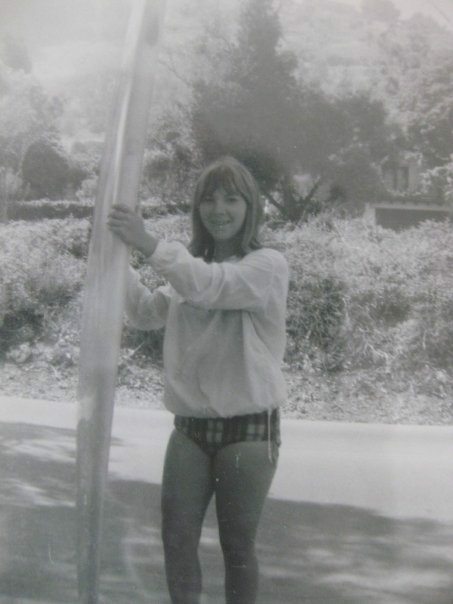 While Lynn’s post was rather succinct, to say the least, it was the photo accompanying her post that grabbed my attention: An 11-year-old girl posing on the beach at Surfside, Texas, circa 1963, with a classic Velzy. She may not have remembered the length of her board, but there was no question as to the length of her smile: At least a mile wild. Over the past 15 months, hundreds of fascinating posts have appeared on MFS, from all over the world and all walks of life. But just the other day, its newest member posted what has to be my favorite. Now, why would that be of any significance? What is so special about a massed produced, “foamie” board that came free with a bucket of chicken? Well, you’ve got to admit: It is a cool story. Coolites were a molded course bubble (Polystyrene) foam board made for beginners. Much like the USA’s Styrofoam boards, found at any coastal drugstore or five & dime, they were basically a cut-down version of the “real” surfboards being ridden by the likes of Midget Farrelly, who endorsed the 4’10” boards for Hanimex Pty Ltd.
Coolites, advertised as “the safe way” to enter the sport, soon flooded Australia beaches and were the first boards for not only D’Arcy, but the like of future World Champions Tom Carrol, Damien Hardman and Pam Burridge. D’Arcy’s particular story is made even cooler by the fact that, almost 40 years later, Stuart is the owner of D’Arcy Surfboards, Australia’s leading environmentally friendly surfboard manufacturer. Stuart, himself, is a world-renowned shaper, custom building for surfers of all levels, including 7-time ASP Women’s World Champion Layne Beachley and Asher Pacey. The fact that Stuart’s foray into the wonderful world of surfing was a KFC Coolite, well, that just seems to capture the heart and soul of what MFS has come to be. You see, whether you’re a heavy hitter like Bing Copeland or Stuart D’Arcy, or just a plain, ordinary surfer like Scott, Rick, Sarah, Lynn or myself, it doesn’t really matter. Surfboard ownership is a coveted ticket to a whole new dimension, a truly special relationship with Mother Nature that no amount of money can buy. There are millions of surfers around this great, big world, and only a precious few truly master the sport. But all surfers have one thing in common: They have the attitude. Check that…make it two things: They all remember their first surfboard, too. How much did a board cost in avarage in 1950? saNice photos you got here! Such memories are worth a treasure and yes, in this life, there is always what we call “first time..” 😉 Have a pleasant day! Thanks for the nice words Justin. I never really thought about it, but I KNOW my mom wouldn’t have stolen my Bing. She only rode Velzys. Hey, Really cool article! I think I will join you on Facebook too… One thing caught my eye while reading this. Do you think that possibly you mother “stole” your board to teach you a lesson? I only say this because this is something my mother would have done…….. Either way I know one thing, my mother was always right….